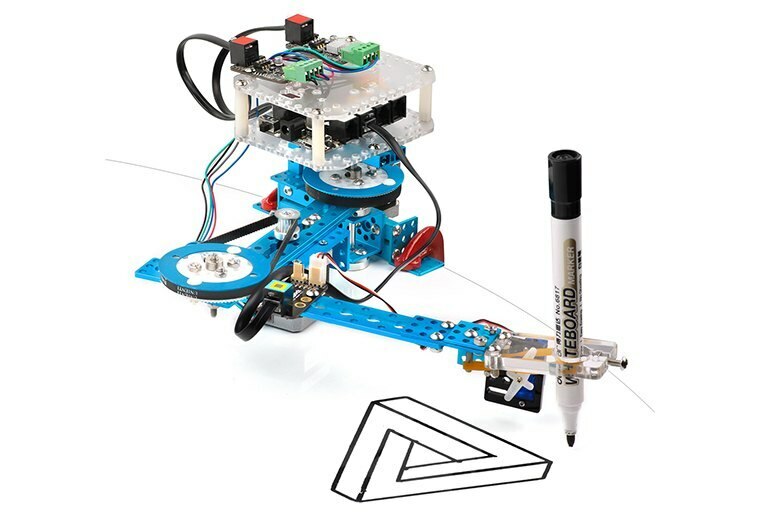 For budding roboticists who want robots that can do something practical, these drawing bots are a smart option. The robots can be programmed to interpret data (such as from a heart rate monitor) to draw graphics. High quality parts and smart engineering make for straightforward construction projects--though you'll need to pay careful attention to avoid errors. 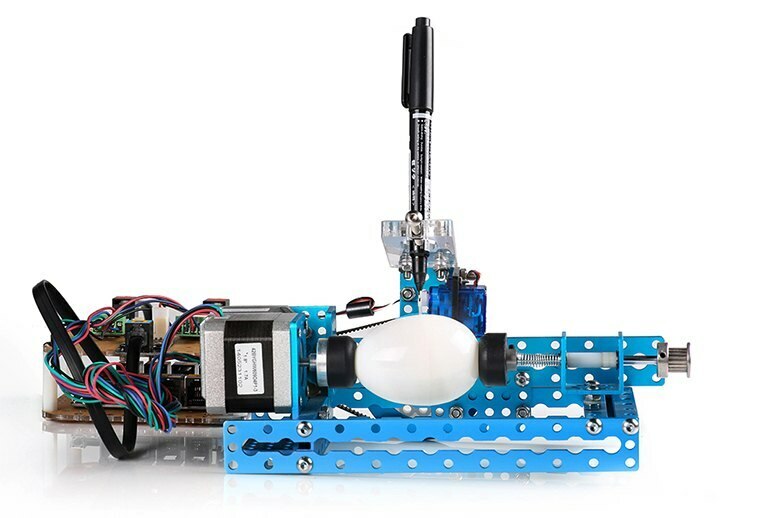 You can only build one robot at a time, so you need to disassemble one to create another. Early reports reveal the drawing software to be buggy; research the purchase carefully if you aren't a proficient programmer. Limited information is included in the box about how to test and run your bots after assembly is complete, so online research is essential. 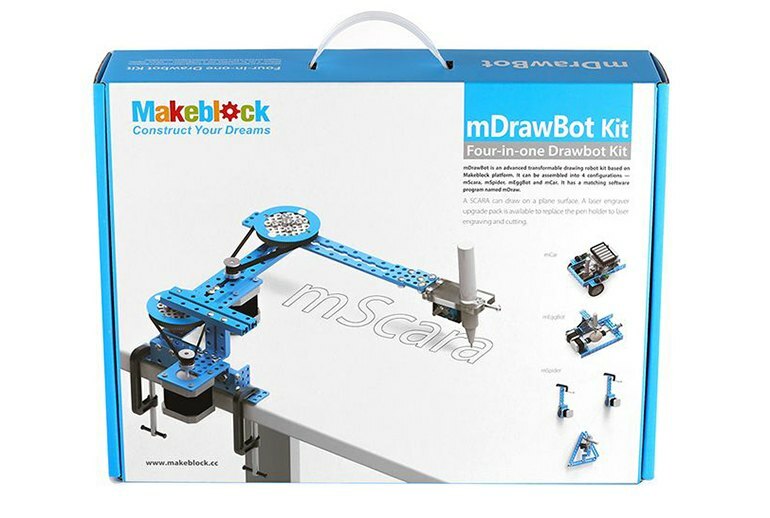 Those old enough to have played with an Erector Set will feel right at home building robots with Makeblock's mDrawBot Kit. Or, because it's intended to be an educational tool that teaches the rudiments of robotics and programming, perhaps they'll feel at home helping their kids play with it. 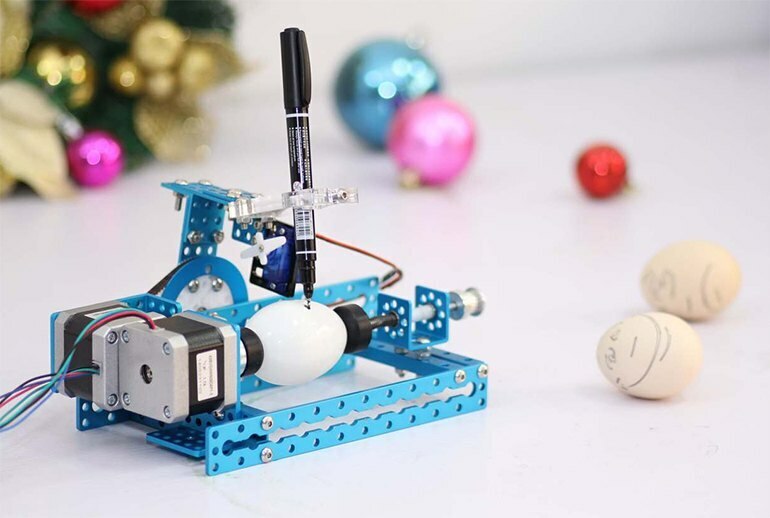 This Kickstarter graduate is a 4-in-1 package that includes parts and instructions for four different kinds of robots that include a car, a wall-climbing spider, and an egg engraver. 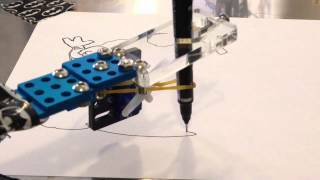 Each bot holds a pen and can be programmed to draw richly detailed images like an old-fashioned plotter. You can also add an optional laser engraver and Bluetooth module for additional flexibility. Makeblock is like a marriage of Lego, TinkerToys, and Robotix, just much higher quality. 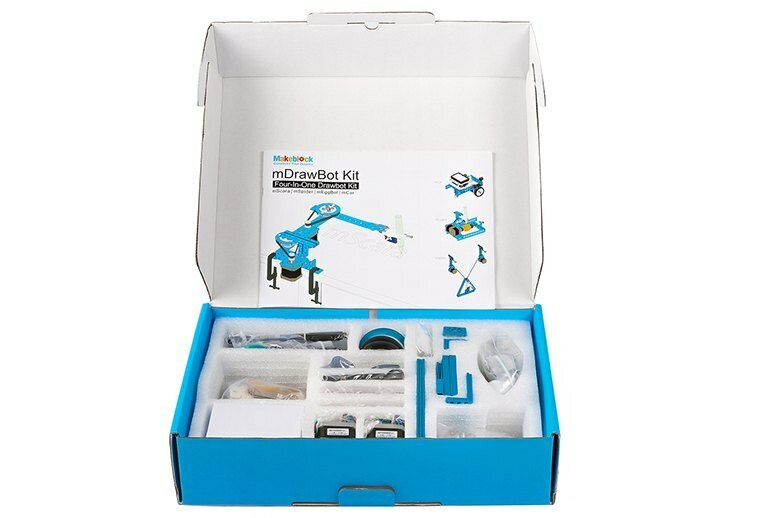 This was the perfect kit to start teaching my 9 year old daughter about using computers to draw, paint, etc. The kit is fully loaded, even including 2 clamps for the securing the drawing arm and the two expensive stepper motors. 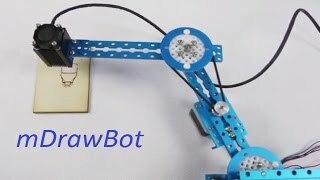 mDrawBots, a Kickstarter project from MakeBlock, are very reminiscent of old-timey Erector sets with one interesting difference: These robots can actually do cool stuff. It can be used to do more than draw pictures, however -- it can also be used to draw out data coming from some other device, such as a heart rate monitor, or to fill in charts. 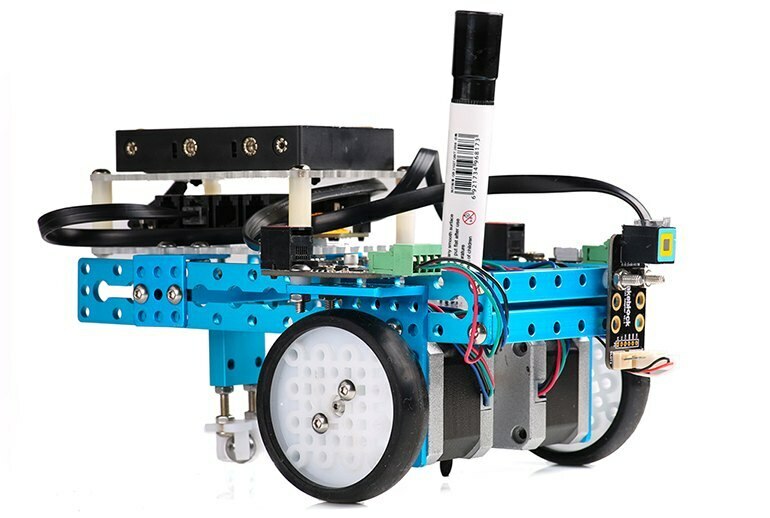 The robot can also be updated with things like a gyro sensor or an accelerometer. 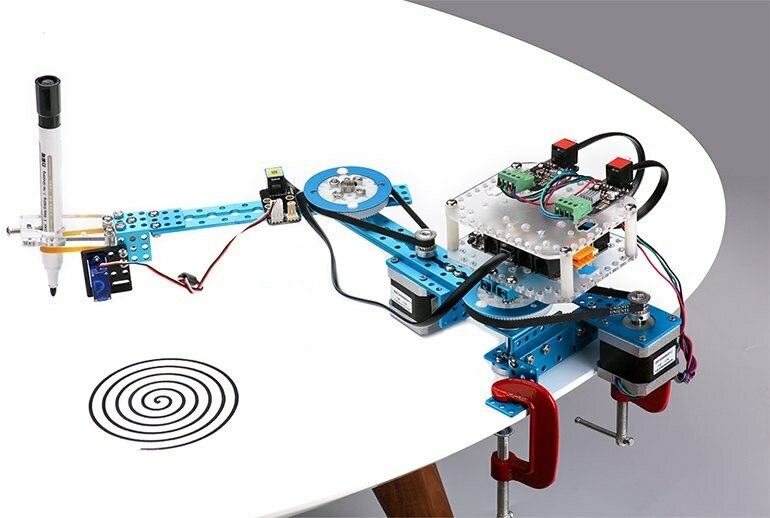 The four different configurations give you the choice between a drawing arm that clamps to a table, a car-style bot that drives and draws, a polarbot that draws on vertical surfaces, and a robot that draws on an egg. As usual, most of the Makeblock mechanic parts are made out of blue anodized aluminium. Strong, durable and lightweight. All parts can be assembled without special tools. A screw driver and hex keys are included in this kit.